Go on a self-drive adventure in one of South Africa's most beautiful regions. Visit the battlefield of Spion Kop. Enjoy game drives in Nambiti Game Reserve. Witness the Big Five on a private reserve. Go on a safari just a few hours away from Cape Town. Breakfast, lunch and use of swimming pools included. 3-hour sunset and sunrise game drives. "Big five" bush walk with armed rangers. Go game driving at Balule Big 5 Reserve. Visit a South African game reserve. A private tailored wine tour to meet your requirements regarding wines and vineyards. The number of vineyards visited is at your discretion within the time constraints. Full-board 4 star accommodation, meals and 2 game drives. Private tour guide/driver and private vehicle. Overnight safari to Aquila Game Reserve with private transfers from Cape Town. Encounter gentle giants on a game drive through Addo Elephant National Park. Embark on a half-day guided walk in the mighty Drakensburg Range and some spectacular hikes along the Garden Route. Delve into the astounding Cango Caves outside of Swellendam. 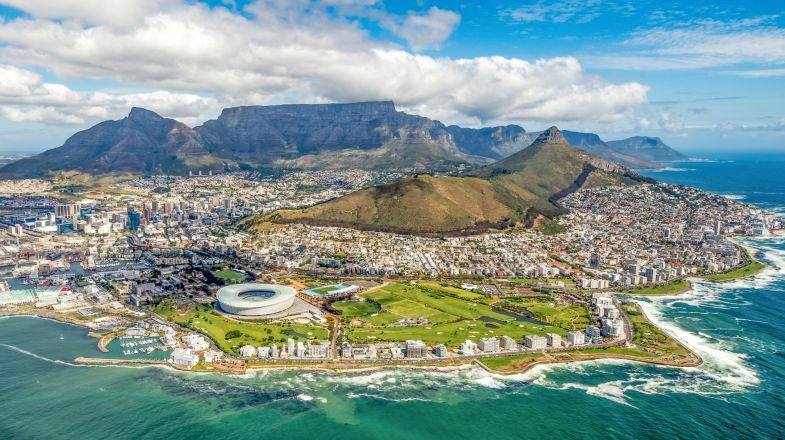 Discover Cape Town and Table Mountain. Try regional produce from the vineyards of Stellenbosch and Franschhoek . Visit Cape Algulhas - the southernmost point of Africa. Addo Elephant National Park + game drive. A morning boat trip and marine adventure en route to Dyer Island and diving with sharks. Enjoy an afternoon wine tasting. Scenic drive to Gansbaai with continental breakfast. With a range of iconic landscapes such as the sight of penguins in the Cape, the Table Mountain, hippos of the Limpopo River, the lions and crocodiles of the Kruger National Park, the various ecosystems of iSimangaliso Wetland Park and those exotic wildflowers of Namakwa, South Africa is one of the most diverse countries in the world. South Africa witnessed a miraculous transformation from being a racial mess to becoming one of the pioneering countries that redefined mankind, brotherhood and democracy. Today, the country proudly welcomes more than 9 million visitors each year and presents a country that is no longer defined by its racial divide. Today, all that matters are those beautiful sights, those remarkable feats of engineering and that rich enviable lifestyle, and their natural fauna and flora. Explore the modern city of Cape Town. See the sights in Johannesburg, such as the Cradle of Humankind—an archaeological site that is filled with history and wildlife. Learn of South Africa’s history at the Apartheid museum. Marvel at the Boulder’s Penguin Colony. Experience the gentle giants, elephants, at Addo Elephant National Park. Tour the South African wine country, in the Winelands. Visit Robben Island, and stand in the shoes of Nelson Mandela. Drive along the Garden Route and see the coast of South Africa. When on a holiday in South Africa, try not to be too flashy in what you wear in order to draw less attention to yourself. While most of South Africa is malaria free, if you go north, come prepared with malaria pills. Bring clothes for warm weather, but also prepare for cooler evenings. If driving in a car, keep the doors locked and windows up at all times. If people try to approach you, ignore them. Mobile coverage is simple to get and available. Be prepared to veer off the beaten path. For example, visit Seal Island, off the coast of Cape Town. South Africa has seasonal weather so please do check up on the best time to visit South Africa before planning your tour. And if you’re still hunting for more things to do and places to explore in South Africa, do check out our South Africa Travel Guide for more information.